If you have ever sprained one of your limbs or broken a bone, then you know what a splint or a cast is. A splint is a piece of molded thermoplastic splinting material that used to keep an injured body part from moving to protect it from any further damage. This material is usually applied by a medical professional who knows how to properly mold the splint so that it becomes rigid and stable around the injured area. 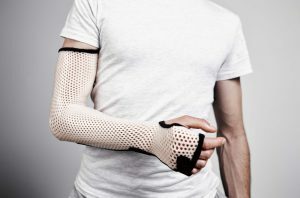 Musculoskeletal conditions that induce inflammation, such as fractures or a sprain can be properly treated and healed with the aid of a splint. Thermoplastic splinting materials, such as Orfit or Manosplint, can be molded to fit any part of the body with the right treatment process. With this material, thermoplastic splints can be formed by softening the material with heat. Melting down the material in hot water will make the material soft and allows it to easily conform around the injured area. Thermoplastic splinting material come in various shapes and colors. Precuts and strips are meant for specific parts of the body. Precuts remove the hassle of cutting and molding the splint to conform the injured area. Strips, like precuts, are meant to support smaller body parts such as the fingers. Strips are perfect for quick and easy production of splints for fast stabilization of small injured areas. Thermoplastic splinting material also comes in large sheets to treat any body part that needs support. Doctors can measure, cut and mold these splint sheets to meet their patients’ needs. Splinting material also comes in a variety of colors. If a patient wants his or her splint to look more appealing, thermoplastics such as Orfit offer more colors than just white or beige. Unique colors give more appeal to patients of all ages and can boost patient morale and improve compliance. To see if your injury needs a splint, it is recommended to consult your doctor. For more information on splints, click here.